Ken Pomeroy is a 15 year old singer/songwriter with a Folk Americana sound. Transcending her age, Ken has a unique vocal quality that blends smoothly with her heartfelt lyrics. Ken began singing, writing songs, and playing the Baritone ukulele at age 9. She quickly learned to play the Concert and Soprano Ukulele, and at age 10 began playing guitar. Every year she is a regular at the Woody Guthrie Folk Festival, playing the Lou’s Rocky Road Tavern stage. Fans can catch her playing in local venues around Oklahoma City, and Norman. She has played the Grand Stage at the Riverwind Casino, and she is also a regular at the Oklahoma Rodeo Opry. 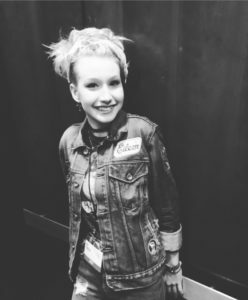 In 2016, Ken received the Rising Star award from the Songwriters Association of Norman, and has attended the Rock & Roll Camp for Girls since its inception in 2015. Ken released her debut EP “Minutes to Hours” earlier this year; she is currently writing and recording new songs for her follow-up CD that will be released in the summer of 2018.